Featuring an attractive satin finish to cut down on the need for polishing and buffing, the Bobrick B-6867 Surface-Mounted Toilet Tissue Dispenser is an attractive choice for use with any type of hard surface in your commercial restroom. The double-roll design can hold two rolls of toilet tissue up to 5-1/2 inches in diameter. 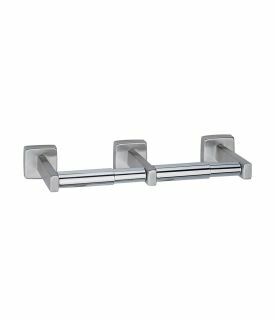 For mounting, the dispenser has a wall plate and concealed flange mounting brackets, which are crafted from 16-gauge stainless steel for extra strength. The attached flange and support arms feature 22-gauge stainless steel, and the entire unit is made of the type-304 austenitic steel variety. Chrome electroplating finishes the pair of chrome spindles. The dispenser is 12.5 inches in width by 3-15/16 inches in height and has a recommended mounting height of 20 inches above the floor in keeping with barrier-free accessibility guidelines. Theft resistant spindles can be purchased to substitute for the standard spindles. The part number for these is 283-604.